The ability to design several systems in one project in order to design the entire system for the building at the same time. 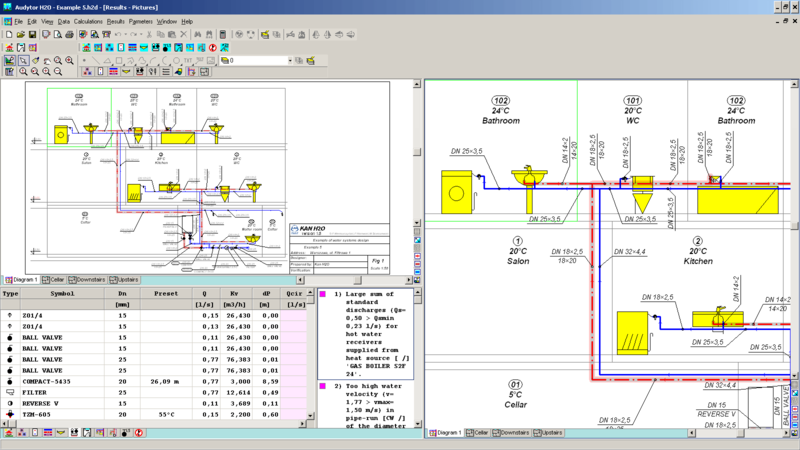 Program Audytor H2O enables to design very large water supply systems (even thousands of accessories and draw-off points). Program is equipped with a highly efficient analysis algorithm of graph installations and efficient algorithms of selection of pipes, fittings and accessories, which allow to calculate large installations in in less than a few seconds. While entering data the program maintains the control of their correctness, which allows the designer to reduce the number of errors. The correctness of the results is being controlled during the calculation process. The ability to design several systems in one project. Unlimited size of the installation (even thousands of accessories and draw-off points). Building underlays in the most popular vector and raster formats. The list of detected errors as a result of the data- and calculations results correctness check is created, where types of errors and their locations are listed. The program is equipped with the fast error locating mechanism (automatic table location, row and column with the error data, together with indication of the erroneous item in the installation diagram). Calculations results are presented both in the graphic, as well as table form. Picture layers format and label format for individual system components can be freely modified (the choice of highlighted quantities, color, font size, etc.). 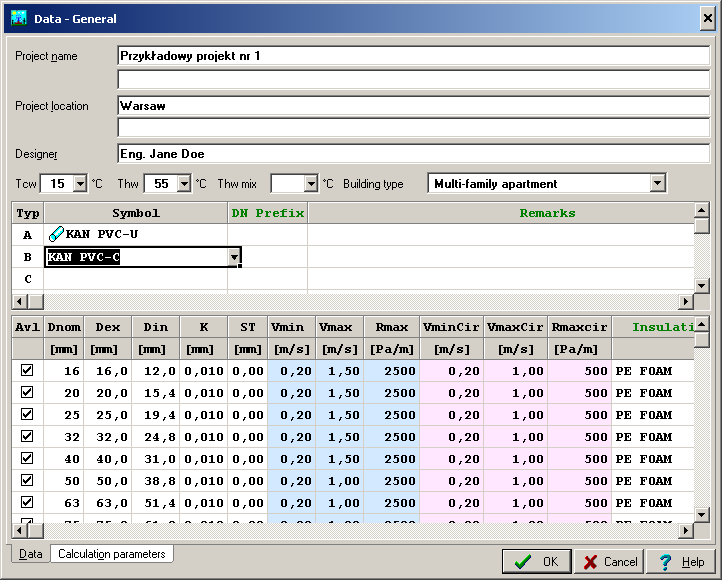 Calculations results can be also presented in the system plan view. The contents of all tables can be formatted (choice of shown columns and rows, font size) and sorted according to freely selected filter. Tables with calculations results can be printed and moved to other applications functioning in the Windows environment (eg. spreadsheet, word processor, etc.). Print preview function enables viewing the pages before printing. Calculations results as plan views and installation diagrams can also be plotted onto the plotter or printer. The user can choose the plotting scale. Plot preview function enables to check the pictures before plotting. Larger pictures are printed or plotted in fragments which then can be combined into one-piece printout, so even large pictures can be executed with the ordinary A4 printer. Working in MS Windows environment makes the program user-friendly. Principles of cooperation with other standard programs for MS Windows make easier the use for those familiar with Windows enviroment. Thanks to graphic designing process, most info on the installation being designed is entered into the drawing of the installation diagram. Necessary information on the drawn elements are introduced in the tables associated with the installation diagram. This makes it possible to edit both single wires, radiators, fittings and whole selected group. The program checks, whether no errors, disabling the continuation of calculations, have been encountered. 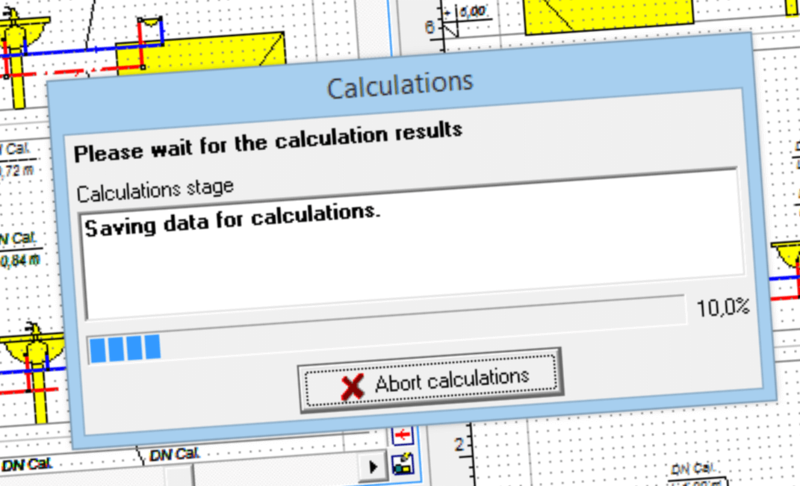 If further calculations are not possible, the calculations’ process is stopped. Info on errors is stored in the file with encountered errors. 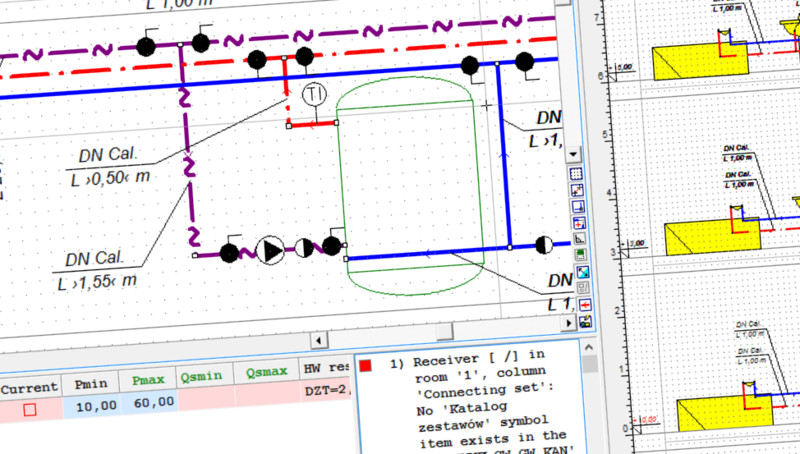 aided linking of pipes, draw-off points, accessories and other syste elements. Thanks to the copying function for the freely selected picture elements, it is possible for example to enter the fragment of the installation diagram onto the whole storey (subsequent risers or dwelling systems), and then automatically create the diagram and data for the subsequent storeys. The program's graphic processor enables drawing individual system components and other graphic elements, with their later edition (moving, copying, pasting, deleting, editing components data). Drawing and edition methods in the program are very similar to the methods you are familiar with from other popular graphic programs of the MS Windows environments. It is possible to modify dimensions, as well as the rotation angle of previously drawn components. It is possible to add the remaining layer parameters, such as the line style, thickness, color, filling ecc. Drawing properties enable modification of the picture's appearance, element selection method, undo history, system components linking aid and many other features concerning creating the system picture. The program enables creation of the complete graphic documentation of the system design, thanks to the possibility of displaying the calculations results on the storey plan views. It is often required to enter the picture of the project under design. Pictures can be entered by reading pictures from a file, scanning or pasting from clipboard. After being entered, pictures frequently require levelling, calibrating, cropping and additional correction. Technical drawings (eg. underlays) are now as a default created using computers. They are then available in the electronic format as files. Vector formats (eg. 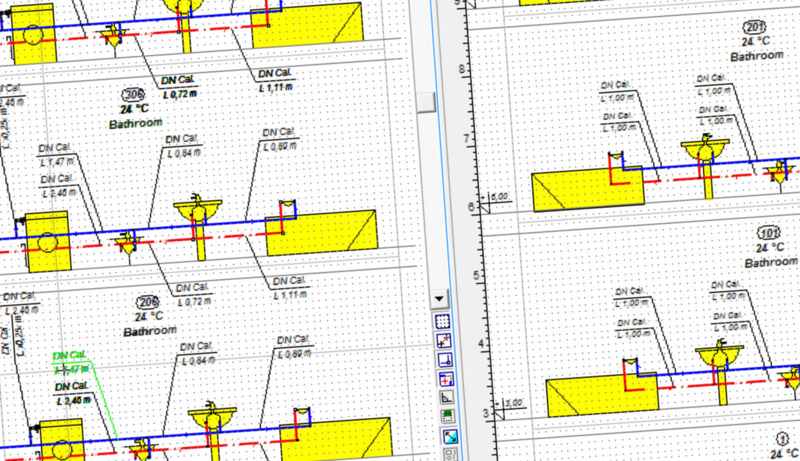 DWG, DXF, WMF, EMF) are the most suitable for technical drawings. Picture files can also be created as scans, then they are almost always available in the raster format (BMP, JPG, JPEG, TIF, TIFF, GIF, ICO, PNG). Usually, while loading the picture, it will be necessary to complete information from the dialogue Picture units. After the picture has been inserted into the program it is usually necessary to perform its levelling and cropping, also the calibration might prove necessary to adjust the picture to its electronic equivalent. It is possible to choose the resolution and quality of the scan and to save scanned documents in a selected graphical format. The program is equipped with scanners compatible with the TWAIN specification. The program allows to draw storeys on the views. Thanks to that, when using the program you can create the whole drawing specification for the central heating installation’s design. It is necessary to draw a floor plan, and then enter the radiators, pipes and other components. 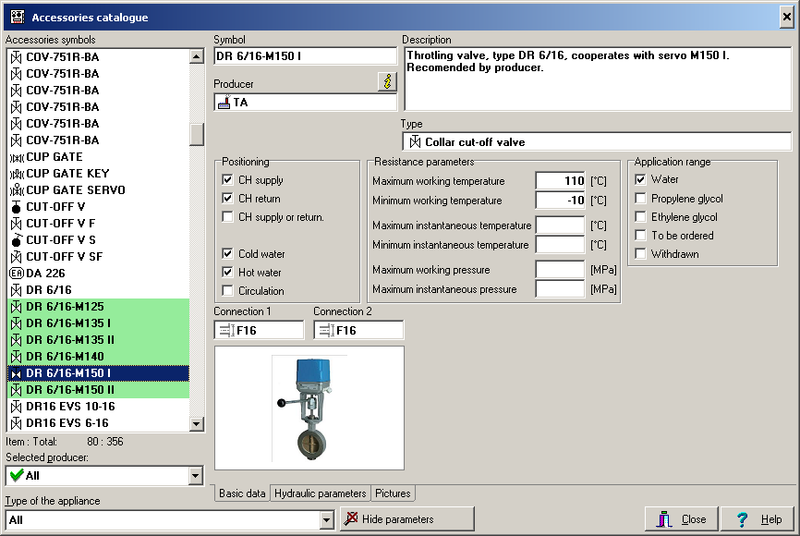 The program describes the radiators and then gives pipe diameters and valve settings. If drawings are available in the electronic form (CAD, CorelDraw, MS Word drawings), it is possible to copy them directly to the program and use as architecture drawings. The program accepts the drawings in WMF and BMP formats. This allows the close cooperation between the architect and the designer of heating system. It contributes to a significant shortening of the design process. While entering data the program maintains the control of their correctness.. The program will store error warning message and info on detected errors in the error file. Error list window has been equipped with the function of positioning errors. The program will highlight the relevant fragment of the picture and display the data table, marking the cell referring to the error that has been found. The error diagnostics allows the designer to evaluate the quality of the project. The program features a fast search mechanism that indicates he place of error(finds the tables, rows and columns with incorrect data and identifies incorrect components in the installation diameter). Calculations results can be viewed both in table- and in graphic format, as well as table form. Picture layers format and label format for individual system components can be freely modified (the choice of highlighted quantities, color, font size, etc.). 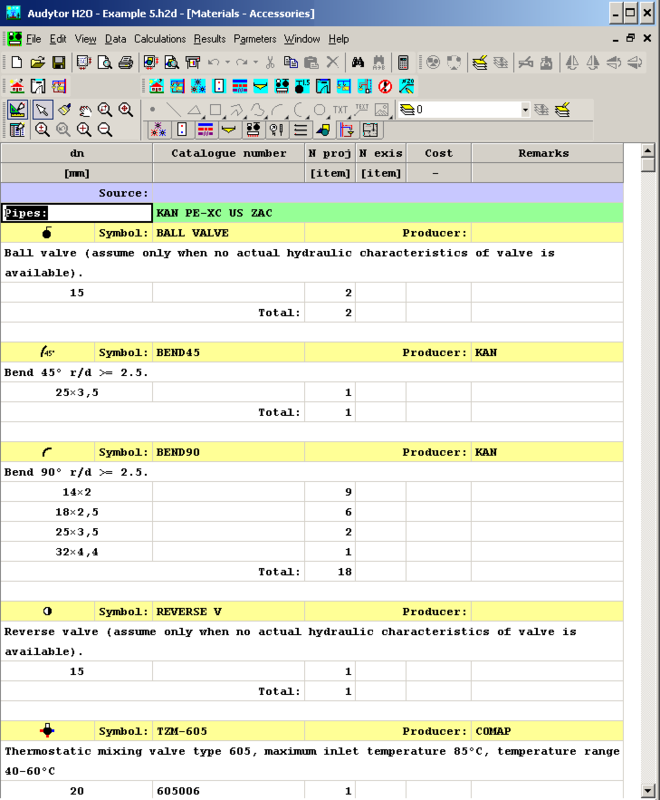 Calculations results can be also presented in the system plan view. The contents of all tables can be formatted (choice of shown columns and rows, font size) and sorted according to freely selected filter. 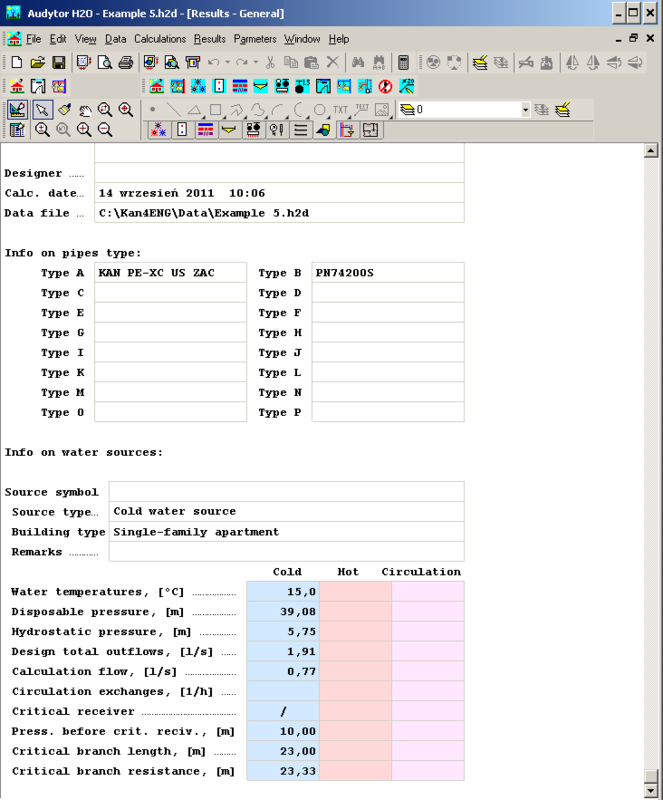 Tables with calculations results can be printed and moved to other applications functioning in the Windows environment (eg. spreadsheet, word processor, etc.). Print preview function enables viewing the pages before printing. 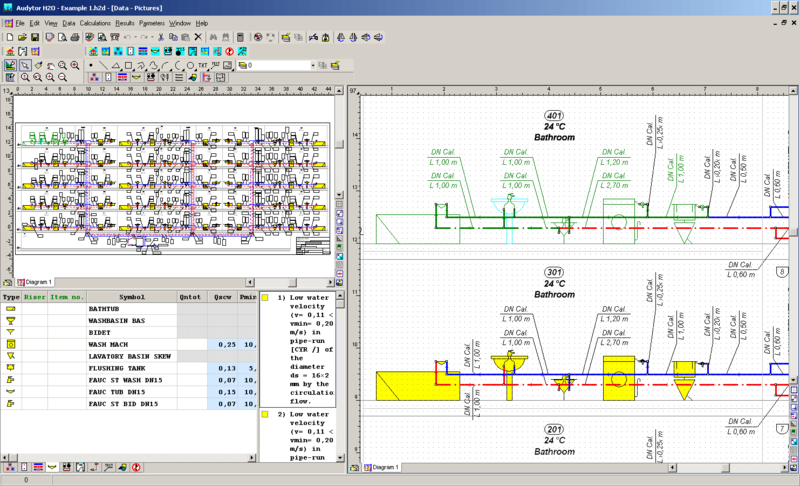 The program is equipped with a function to save drawings in DXF or DWG format. 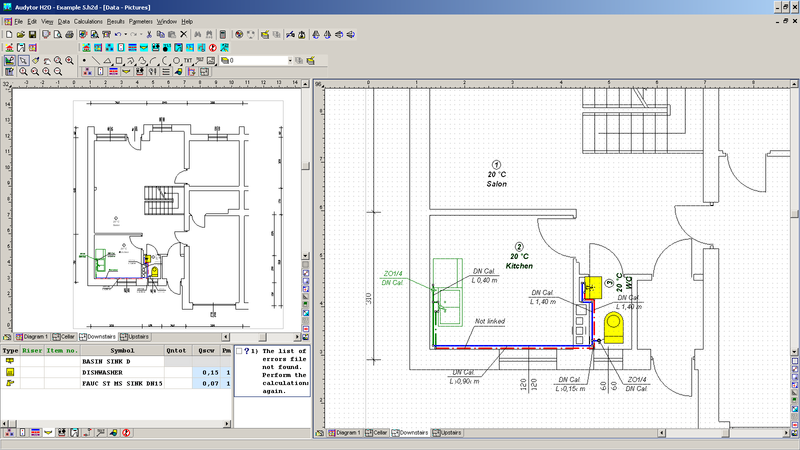 Saved drawings can then be loaded into the program such as Auto CAD. 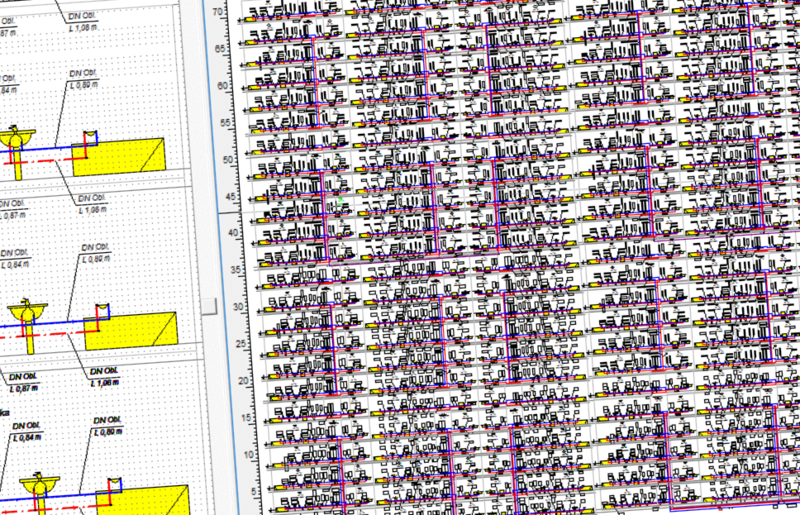 Drawing in DXF or DWG format is divided into layers, and the typical components of the system are stored in the form of blocks.The tables with the results of calculations can be printed as well as transferred to other applications running in a Windows environment (such as a spreadsheet, word processor, etc. ).